A low-budget movie titled “The Innocence of Muslims” makes its way to the media of the region. The movie insults the prophet Mohammad and doesn’t pretend to do so innocently. The mayhem it caused became infamous, notably for the American embassy storming in Libya which made its way to the US presidential elections. Protests across the region turned bloody. Innocent people lost their lives because of cheap ten minute footage. And the image that some Muslims have been giving to Islam over the years was reinforced once again. Malala Yousafzai, a fourteen year old girl, was shot in the head by Taliban individuals who feared her message. Malala’s message was not that of an uprising against the men who worked endlessly to make her life and the life of countless other girls like her a living hell. She was calling upon girls her age to seek an education, which most of us take for granted: the kind where we sit behind a desk and listen all day to teachers telling us things we believe we’ll never need. Her message did not sit well with the Taliban whose mission had been, in part, to eradicate education in the parts of the world where they are of influence. They had destroyed countless schools and forbade women from attending schools in their attempt to restore the days of 600AD. A Syrian woman named Dana Bakdounes posted a picture of herself on Facebook without the veil as part of a movement for the rights of women in the Middle East. (Check the picture here). 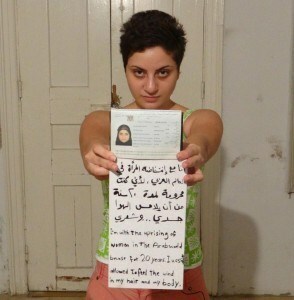 The message Dana wrote, as part of her picture, said “I am with the uprising of women in the Arab world because for 20 years I was not allowed to feel the wind on my body… and on my hair.” The message rubbed some people the wrong way and a bunch of extremists took it upon them to silence Bakdounes, even on Facebook. So they mass reported her picture as offensive, prompting Facebook to remove it. The rise in religious extremism in the Middle East is touching all of its religions. Be it Christians who are worried about their fate and revert to their Bible in belief that it will somehow be their salvation. Or Jews whose reputation has become intermingled with zionism and borderline inseparable in the mind of many. However, I decided to only discuss Islam because the broader picture of the Middle East, in which there’s a tangible rise in Islamist Influence, is a canvas of Islam – as it is the region’s first and foremost leading religion, demographically. The rise in extremism is attributed to many geopolitical reasons. It is also associated with a serious lack of understanding of religion from all involved, most notably the men of the robe who are doing more harm to their religions with their backward mentality than anyone else. The Middle East has probably one of the world’s highest rates of religious people. And it’s simply because we were born this way. We are not allowed to choose what we want to be religiously. I was born into a Christian Maronite family. Therefore, I am a Christian Maronite. If fate had it differently and my parents were from another part of Lebanon, I may have been a follower of a different religion. And this applies to everyone. As we grow up, we are taught our religion and nothing else. Come Sunday morning, it was better for me to attend Mass. For others, they had better pray five times a day, fast during Ramadan and never eat pork or drink alcohol. During my early days at AUB, I was surprised to find that some Muslim people – obviously a minority – had absolutely no idea when Christmas was celebrated. On the other hand, I thought Achoura was a happy celebration. We rarely challenge our religious beliefs because we don’t feel the need to. Those beliefs enable us to blend in our societies and not get ostracized – at least in that regards. They enable us to connect to other people with whom we are able to identify not due to their mentality or thoughts but because of their religious beliefs. At a certain level, deep down, it’s always easier for a “Christian” to make “Christian” friends than to become friends with a “Muslim.” The reverse is also true. Our narrow religious upbringing also limits us to the other religions present around us, especially in the region’s few relatively mixed countries. Egypt’s Muslims know very little about the Copts who were founders of their country. Lebanon’s Muslims know very little about its Christians. The opposite is also true. This lack of understanding, combined with an increased rooting in unchallenged belief, places the seed of conflict, which has been manifesting way too many times across the region. However, religion is but one side of the coin. For with the rise of the Islamists on one side, I believe that the region’s atheist numbers are increasing dramatically, albeit most of them are probably closeted, and they are fueled by the exact same events that are getting people to become more religious, coupled with an increase of education across the board. What people turning increasingly religious see as a threat to their belief, others do not see it as such. What some increasingly religious people do to defend their beliefs, others see as a violation of freedom. What some increasingly religious people feel related to, others want to detach from it. The religious behavior that makes some religious people proud causes others to be the opposite. The picture that some extremists deem offensive, others see as a manifestation of free thought. The children seen as defiling Islam by some, others see as children being children. The girl infecting the minds of other girls with poison, which some (obviously very, very few) believe, others see as a complete violation of every single human sanctity. One part decides to cling further to what they know because of such events. Others decide to look at alternative, which might fit better with how they see the world, away from a notion of faith that has become alien to them. After all, all they’re seeing of faith is repeated incidences of things they do not remotely agree with, despite that being as remote from what religions call for. Religious people will call it a lack of understanding and narrow-mindedness for someone to turn atheist. They will never be convinced how someone who was born and raised on certain teachings can ditch them entirely and move towards thoughts that they find revolting. What they don’t get is that the same rhetoric they use applies in similar fashion to atheists who are moving away from teachings that they find revolting and forced upon them throughout their years. Of course, this does not apply to all religious people as some practice their religion in silence, without letting everyone know when they’re praying and when they’re offended. But this silent majority is not the one that gives an impression. Out of a crowd of millions, the person who changes perceptions is that whose voice is heard the most. And in a time of religious insecurity, in a region of political insecurity, the voices heard the most are those of people that rub a whole lot of other people the wrong way. Regardless of where you stand regarding the two sides of the religion-atheism coin, the image being painted is the following: religion is the bread of the poor. Atheism is the butter of the “educated.” However, the only one thing that I believe is of absolute necessity is that the Middle East needs more atheists. This entry was posted in Religion, Thoughts and tagged Atheist, Christian, Christianity, Copts, Dana Bakdounes, Egypt, Facebook, Islam, Jews, Judaism, Lebanon, Malala Yousafzai, Middle East, Pakistan, Religion. Bookmark the permalink. I think they’re both the same. This is precisely what I told some people when the innocence of Muslims movie was released. I think that you should have made the distinction though between atheists who atheists because they don’t want to believe at all and those whose numbers you are taking about who became atheists because of what religious people do. The attitude differs between them, I think. I believe the division is between atheists who believe in individual freedom and reason, and believe Clericalism and social conservatism is just another type of repression. And those atheists who actively want to destroy religion by means of power and provocation, this group has made Atheism itself (with a capital A) another form of repression (see Hoxha in Albania). You can’t ruin my future post like this! I wrote this because I have another one in mind. Yeah of course there’s a difference. And I know where you’re going at. I will have an upcoming post that’s more specific (Lebanon) addressing this. If my country had not seen a sharp rise of secularism in the 60s and 70s my society would have been a b*tch to live in. There was no social mobility, but the leaders of all large demographic groups had to deal with each other and agreed to keep the people a separate as possible to ensure their electorate. They even went as far as having Catholic bakeries, protestant flute bands and so forth. To make sure their communities would sheepfully support them, the religious community leaders would only agree to give women the right to vote if the government would give funding to religious school: a situation which persists (to a lesser extent) today. Including schools which fancy banning gay people but still don’t mind the gays paying taxes for their schools. And when they were done hating on anyone who wasn’t part of a religious community, they would have internal arguments about the literal nature of the snake in the bible (no joke) and that would be enough to split and form a new church. My mother couldn’t go swimming on Sundays because “others” were swimming (e.g. Catholics or “Liberals”). On a even more personal account, when I was born some religious community folks showed up to tell my mom that continuing to work would set “a negative example for the community”. My family has not seen a church service since. There are good practical things about Christianity as well. A lot of charity has a Christian background. Social control in villages would prevent someone from entering in the gutter. And many truely practice the act of charity and compassion. But religion is not a prerequisite for any of this. I don’t like atheist activism and don’t consider myself one. But religion should stay out of politics and nobody should expect a one-way street of respect. I think it’s very different though between the state of Europe back then and the state of the Middle East now. It’s much easier for Christians to embrace a country where their religion isn’t that of the state, even though some laws in Europe are obviously Christian in nature. But when it comes to Islam, their religion also has a “law” aspect to it. So devout Muslims will find it much more difficult to live in a secular place. I think the Middle East needs leaders like those of post-WWII Europe, similar to Ataturk, who aren’t afraid to go against their religion, in order to change the system. When it comes to atheist activism, well, let’s just say it’s a vomit fest. I don’t think religious people clinging more to their religion is a healthy thing, to be honest.